Printed by CreateSpace, 2017. 577 pp. $24.99. 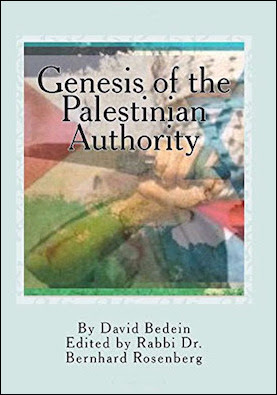 Genesis of the Palestinian Authority collects articles and policy papers by Bedein, director of The Center for Near East Policy Research and founder of the Israel Resource News Agency. The author has covered the Palestinian Authority (PA) from its inception in 1994 and documents how the United Nations and Western countries working with organizations such as the U.N. Relief and Works Agency (UNRWA) have artificially created and sustained the Palestinian Authority using revisionist history and lies. For years, Bedein's main focus has been exposing UNRWA, established as a relief agency for Palestinian refugees. He demonstrates how UNRWA has exacerbated the Israeli-Palestinian conflict and created new generations of "refugees" who demand the "right of return" and advocate for the destruction of Israel. One section of the book is devoted to portraits of terrorists who were educated in UNRWA schools where a toxic curriculum of anti-Semitic and pro-jihad incitement is taught daily. UNRWA textbooks incite students to violence and are condoned by the Palestinian Authority and, not astonishingly, by the United Nations itself. In a list of questions, which Bedein suggests the media put to PA officials, he includes, "Will you remove from all Palestinian Authority schools and libraries the Protocols of the Elders of Zion as well as the doctoral thesis written by Abbas that asserts that Zionists worked with the Nazis to conduct mass murder of Jews in World War II?" Bedein explains how both the Oslo accords (1993-95) and the dismantling of Jewish communities in Gaza in 2005 were disastrous blunders that emboldened the Palestinian Authority and Hamas to continue their jihad for the destruction of Israel and the murder of Jews. He warns that the "peace process" is merely the continuation of the war against Israel by political means. A case in point is the training of Palestinian Authority policemen that took place in conjunction with the Philadelphia Police Department in 1995. Despite the good intentions of those who envisioned this program, it in fact helped create an armed militia for the Palestinian Authority that ultimately was responsible for the deaths of more than a thousand Israelis. The book is a treasure trove of documentation exposing how the Palestinian Authority has morphed into a terrorist entity while successfully presenting a façade of reason and moderation to Western governments that continue to fund its deadly activities.